FortisAlberta recently presented a cheque for $3000—a Community Naturalization Grant—to the Village of Thorsby earmarked for the Communities in Bloom (CiB) Community Garden Project. (l to r) CiB Vice Chair Carmen Fisher, CiB Secretary Reg McDougall, CiB Chair Barry Rasch, FortisAlberta Stakeholder Relations Manager Nicky Smith, and FortisAlberta Power line Technician Roland Tosczak. Photo by Coreena Van de Capelle. Summertime. Dew kissed, mouth-watering, delicious and nutritious, garden-fresh veggies. When a bountiful harvest is the fruition of our own efforts, when we take full control of the input quality, it takes on extra special meaning. To that end, Thorsby Communities in Bloom (CiB) will be offering a new community garden for residents who may not have access to a garden plot–thanks to FortisAlberta. 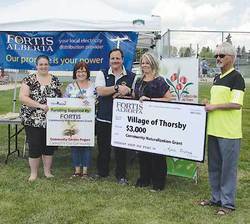 On May 18, 2013, FortisAlberta presented a Community Naturalization Grant cheque for $3,000 to the Village of Thorsby for the CiB Community Garden Project. This generous grant will fund the planters ($1,965), freight ($365), soil and plants ($670). Eight 3-foot square planters—the same millstone-type planters currently in place around town—are expected to be located at the Arctic Spas Rec Centre. There, according to Barry Rasch, the Chair of Thorsby CiB and Village of Thorsby Mayor, “People will be able to access the Community Garden at any time. The 22” raised height will give easier access for the elderly to garden without injury. Imagine coming to pick your own fresh lettuce and taking it home.” CiB will provide the required planter maintenance, water access and helpful gardening tips. The Desert Planters offer big savings in many areas. They have a built in reservoir that reduces the need for daily watering and use less water–traditional planters use approximately 19,000 liters per growing season, desert planters only use approximately 6,500 liters. Traditional planters require 1,280 labour hours over the season to water and maintain vs. Desert planters use 250 labour hours. Green House Gas savings–traditional planters emit 13.32 Tonnes of CO2 emissions in the watering and maintaining whereas the Desert Planters emit 2.68 Tonnes. Some may wonder why a regular “in ground” garden was not utilized. Rasch said that traditional garden methods would require a permanent location, sod to be removed by equipment, soil to be brought in by truck, the need to build a boarder, and dealing with problems related to maintaining the garden. When the planters are connected together, they create an instant vegetable garden space. Less maintenance is required because it is self-contained—no unwanted weeds or grasses. The walls are made of recycled plastic so no maintenance or painting is needed. The planters are portable should they need to be moved. No equipment is required to put them in place. These planters will provide a low maintenance garden space for Village residents for many years to come.